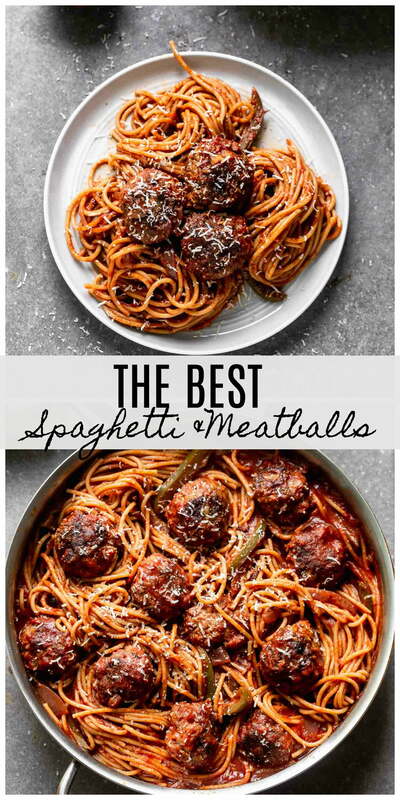 That title is a bold statement, but honestly, these really are The Best Spaghetti and Meatballs There Ever Was. Just read the dozens of reader comments below! 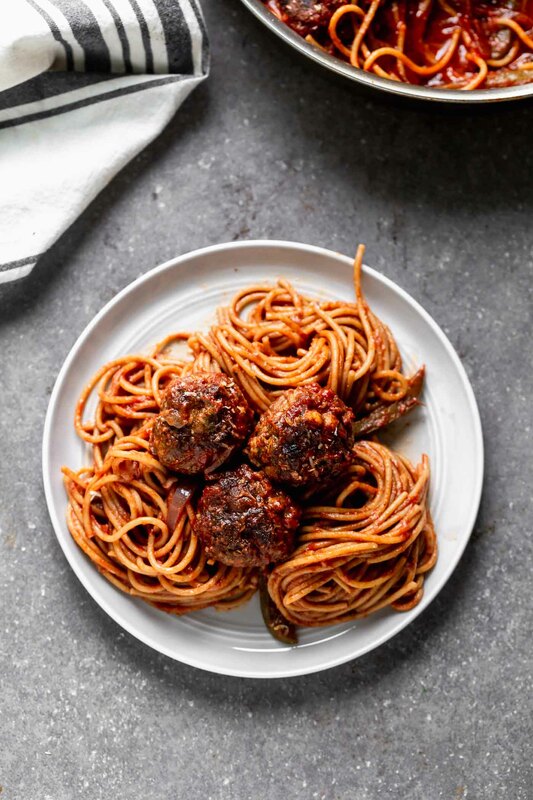 We LOVE spaghetti and meatballs in our family, and while these are in fact, the “best,” be sure to check out these Five Ingredient Spaghetti and Meatballs, these Lighter Spaghetti and Meatballs, and these One Pot Healthier Spaghetti and Meatballs. 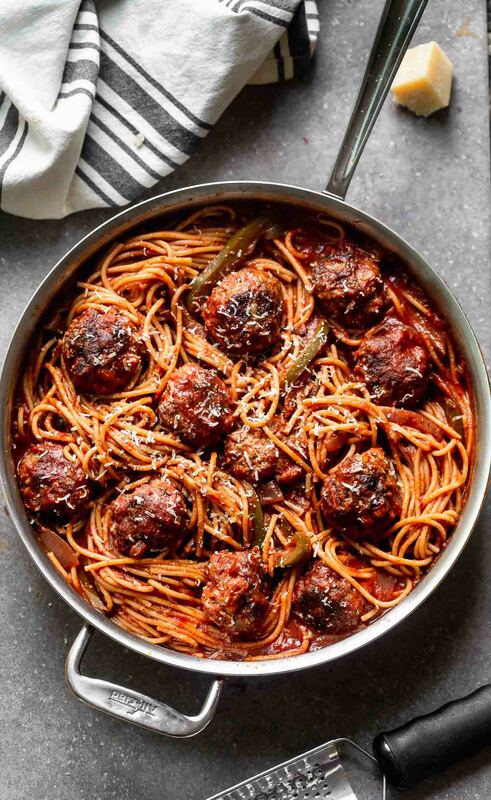 Spaghetti and Meatballs – the ultimate of all comfort foods, right? Would you believe me if I told you this is the best spaghetti and meatballs you’ll ever have? Well, it is. I wish I could take credit for it, but all the glory goes to my Mom. She’s made these (almost) exact spaghetti and meatballs my entire life, and now, it’s something my family will grown up eating. God’s honest truth, we have yet to go to a restaurant or home kitchen where the meatballs were superior to hers. 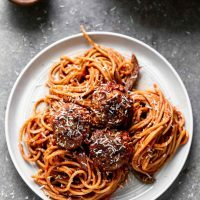 Call it bias, call it favoritism, call it what you want, but it’s true – you won’t find a spaghetti and meatball recipe as good as this one. 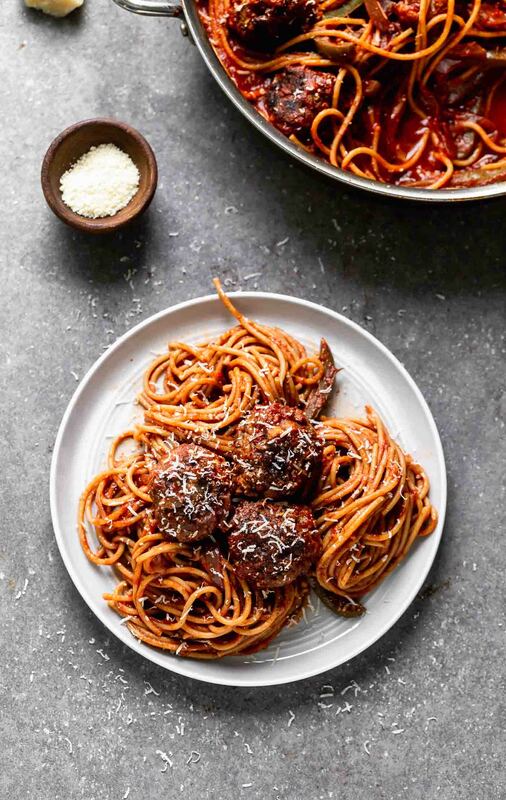 When I was in college I tried to come up with my own “perfect” spaghetti and meatballs, because I was very into making every single recipe my own (establishing my independence… or something like that), but mine never turned out as delicious as hers. I perfected the soft meatball, but hers were slightly denser with more texture. I used expensive San Marzano tomatoes, but my sauce was always lacking depth of flavor and the smooth, thick consistency of her sauce. After five or six failed attempts, I had to waive the white flag of defeat and call her up to figure out what her secret was. Of course there’s ground beef, but what makes these meatballs extra special is the addition of Italian sausage and saltine cracker crumbs. The Italian sausage adds flavor you just can’t get anywhere else and the cracker crumbs aid in a softer, but still toothsome meatball. 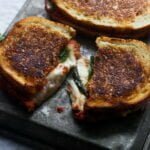 There are also the typical seasoning you’d find in a meatball recipe – onion, garlic, Italian seasoning, salt and pepper – as well as a little bit parmesan cheese and an egg. Really, the only thing I do differently than my Mom, is add in a little bit of grated yellow onion for added moisture and flavor. Once everything is mixed, form the mixture into meatballs. In our family, the meatballs are huge – I find that the bigger they are the more likely they are to stay moist. A little pro tip for ya. After all of the meatballs re formed, brown them in a good amount of olive oil – about two tablespoons. Make sure to brown them on ALL sides, and don’t worry about cooking them through, they will finish cooking in the sauce later. This was always where my main problem was. I could never get the sauce to the right flavor or consistency, and after talking to my Mom and re-making it her way, I found out it was because I wasn’t using red wine and I was using whole canned tomatoes instead of tomato paste, which was making for a slightly watery, less flavorful sauce. Now, I use tomato paste in almost all of my sauces – pizza sauce, marina sauce, soups, stews – the depth of flavor it adds is unbelievable, almost like you’ve been letting it cook for hours and hours – of course you don’t have to let people know that wasn’t the case…. Once the meatballs are done browning, transfer them to a plate and throw the sliced onions and peppers into the pan. Let them sweat a bit, then deglaze with a healthy dose of red wine. Add in your tomato paste, water, sugar, salt, Italian seasoning and garlic powder, then give it a quick stir. Transfer your meatballs (along with all those juices!) back into the tomato sauce and simmer until the meatballs are cooked through, the sauce is thick and your house smells like an Italian grandma’s kitchen. And there you have it…the best spaghetti and meatballs there ever was… the end. It’s important to remember to just mix the meat until it’s combined. Overworked meatballs = tough meatballs. Do not move the meatballs until they’re ready to turn over! Once the meatballs are perfectly brown, they will easily release from the pan. Choose a wine that you would like to drink. Using your hands combine, ground beef, italian sausage, egg, cracker crumbs, salt, black pepper, Italian seasoning, diced onion, grated onion, garlic and parmesan. Form into 9-10 meatballs. In a large skillet, heat ⅛ – ¼ cup olive oil over a medium-high heat. Brown meatballs on all sides, remove from skillet. Add in sliced onion and pepper, cook for two to three minutes. Deglaze pan with red wine, scraping up brown bits as you go. Add in tomato paste, cook for 1-2 minutes. Add in water, Italian seasoning, sugar, salt and garlic powder. Stir. Add meatballs back into the sauce and simmer for 30 minutes, until meatballs are cooked through and sauce is thickened. If needed add more water. Season with salt, pepper and sugar. While the sauce is simmering bring a large stock pot of water to a boil. Add a small handful of kosher salt. Cook spaghetti until aldente. Serve with grated parmesan cheese and chopped parsley. 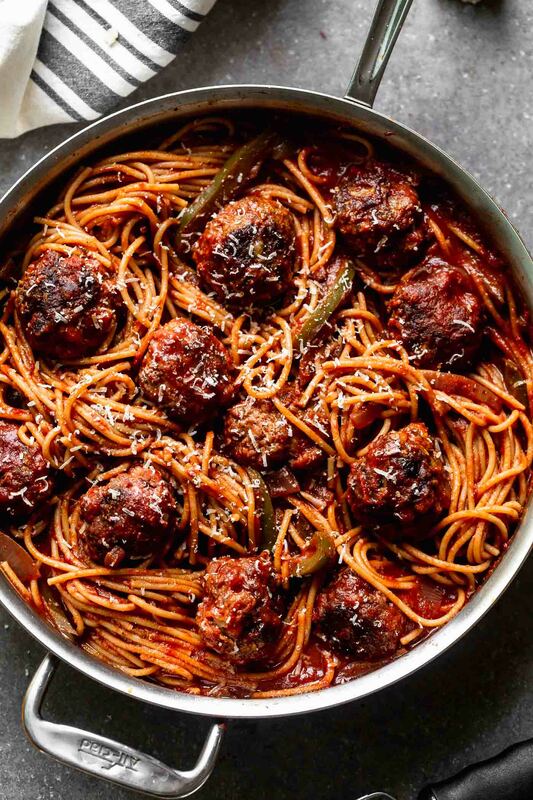 These are the BEST Spaghetti and Meatballs you'll ever make! Promise. The meatballs are packed with ground beef, Italian sausage, parmesan cheese, and crushed saltine crackers (the secret to tender, perfect meatballs). They're then simmered in the easiest, most delicious red wine and tomato sauce. For the meatballs: Using your hands combine, ground beef, italian sausage, egg, cracker crumbs, salt, black pepper, Italian seasoning, diced onion, grated onion, garlic and parmesan. Form into 12-15 meatballs. In a large skillet, heat 2 tbsp olive oil over a medium-high heat. Brown meatballs on all sides, remove from skillet. Reduce heat to medium, and add in sliced onion and peppers, cook for two to three minutes until slightly wilted. Deglaze pan with red wine, scraping up brown bits as you go. Reduce heat to a simmer and cook until reduced by half. Whisk in tomato paste, cook for 1-2 minutes. Add in water, Italian seasoning, sugar, salt and garlic powder. Stir. Add meatballs back into the sauce and simmer for 30 minutes, until meatballs are cooked through and sauce is thickened. If needed add a little bit more water. Season with salt, pepper and sugar. 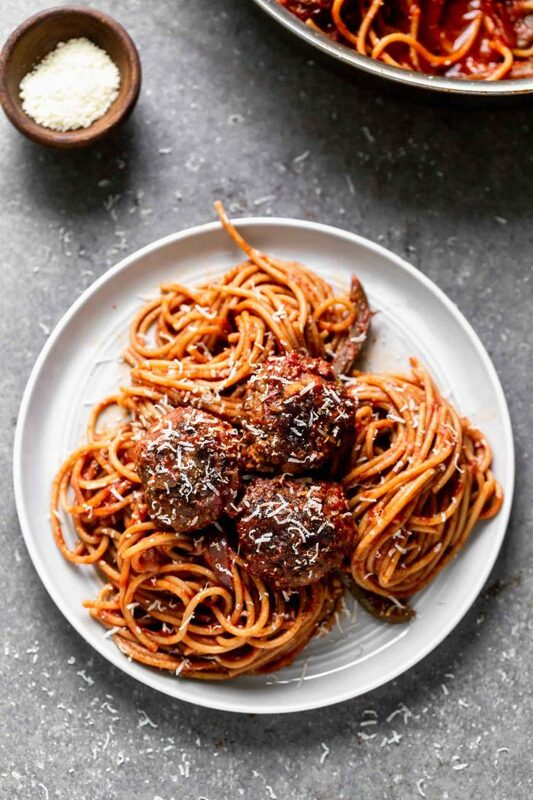 74 Responses to "The Best Spaghetti and Meatballs There Ever Was"
Totally agree – I love making spaghetti and meatballs when I am in the mood for comfort food! This recipe looks delicious – and the photos are so pretty! I might be a tab bit biased :)…Let me know what you think! If I want to fully cook the meatballs what would you recommend? Kim, you could absolutely cook them all the way through when you brown them, just turn the temperature down a tad so they don’t burn. A couple other options would be to make smaller meatballs so they cook faster and don’t dry out, or brown them in the skillet as the recipe states, then finish the cooking by throwing them into a 350 degree oven for 10-15 minutes. Thanks for the wonderful praise! But your pictures are outstanding!! Makes my mouth water!!! Great Job! What size can of paste do you use. It doesn’t sound like it makes a lot of sauce. So no tomatoes at all? Sorry Kim, didn’t mean to leave the size off! It’s a 6 ounce can. It should be enough sauce for four people. If you like more sauce just double the ingredients. I had never made meatballs before, really… These were just ridiculously good. I mean, ridiculous. They were such a hit. Being in Australia, I had to look up what Saltine crackers were, which turns out they’re the equivalent to our Salada crackers. Oh, my god. The bold statement does, in fact, do this recipe justice. Thank you so much Kate!!! So happy to hear they were such a hit! Hi Kate I also live in Australia, what is our equivalent for the canned tomato paste, is it really just tomato paste, 6oz is quite a big can? WOW This was amazing! I’ve never made my own spaghetti sauce, and am usually intimidated by the recipes, but this was simple and delicious! My family loved it and I am quite proud of myself. 🙂 Thank you!! Thanks Halie!! Glad the fam enjoyed it!! Hi there! Just had a quick question about the amount of the Italian sausage that you use. I’ve made Swedish meatballs before however….I’ve never combined the two different meats. My recipe is my Mother’s. Funny how you described that the recipe is just in your Mother’s head…that’s how we do ours. Always comes out the same! Looking forward to making this for my family on Christmas. Ahhhhhh! Talk about last minute! 🙂 Happy holidays! I use two large mild italian sausage links, usually johnsonville or whatever my grocery store is in stock. I believe it comes out to about 8 ounces total italian sausage. Hope this helps! Happy holidays to you as well! I made this recipe and it was good but not as delicious as the spaghetti and meatballs I had at a lady’s house in Venice,Italy.The experiance was out of this world!Try to duplicate the recipe here but utterly failed because the ingredients used over in Italy and here are worlds apart in taste,quality and freshness. What kind of red wine is being used? ? Any red wine will work, but I usually use a merlot or pinot noir. 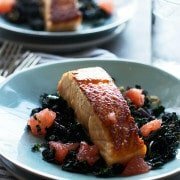 Making this tonight for dinner with my 5 year old little girls assistance ill let you know how it tastesfor us but certainly looks delish! Awesome! Let me know how it goes Chrissy! So delicious! I would just double up in the sauce next time. I was told that the meatballs has too much flavor, but I loved them! Could I possibly use cornmeal instead of crackers being that I’m gluten intolerant? I didn’t see the Italian sausage in the meatball recipe? I didnt see it either….i think she meant to write Italian sausage where she wrote Italian season. Thanks for noticing that! I’ve updated the recipe! So great to hear Julianne!! Glad both you and your hubby enjoyed this! Hi I was wondering what I can use instead of red wine in the sauce. You could use non-alcohoic marsala cooking wine or just omit altogether! Does the itanila sausage get mixed in with ground beef to make the meatballs? Let me start by saying….I don’t cook. Saw this on Pintrest and couldn’t get it out if my head. I made it and EVERYONE LOVED IT! I have picky eaters in my home, even my HUBBY! Soooo yummy! I loved the flavor of the wine in the sauce. Only thing I would do next time is double the sauce so it went a little further. I even took a pic and sent it to my mom and said, “look Mom I cooked like a grown up & I even used WINE!” She laughed because I am 43 years old. Oh my gosh Michele, thank you SO much, there’s nothing that makes me happier than when someone has tried one of my recipes and LOVED it. Bonus, your name is Michele (with one l) just like my Momma whose recipe this is based off of, AND her last name is Shoemaker, so she is also Michele S. — so weird! Thank you for sharing!!! Crazy because I know a MicheLe Shoemaker!!! My sons friend Jack, that’s his mom. So crazy! HA Ha! Ok so I’m going to make this again tonight for Sunday dinner. I forget, when guy say “cans” of water you are talking about the small tomato paste cans right? That’s so crazy! Small world! Yes, just the cans from the tomato paste! Thank you so much Nichole! This recipe lived up to the “Bold Statement” in the title. Before simmering I was concerned because I thought I had put too much wine in. (an Australian Shiraz using the glug, glug measuring method) but after the simmering was complete it was just right! My dinner guests raved and I was glad I had doubled the recipe as everyone had seconds! Next time I will make it x3 so I have some leftovers. I highly recommend it to Pastafarians everywhere. It IS a bold statement, so glad it lived up to it Harry!! Thank you so much for your comment! I made it this but I chopped up some mushrooms (finely chopped no big chunks) and sautéed them in the same pan I used for the meatballs before deglazing. #2 in your instructions doesn’t mention adding tomato paste although it is obvious of course since you mention adding the water which requires the tomato paste can to be empty. Love to hear this!! !So glad you liked it! I updated the instructions, must have been scatter brained that day! Thanks for noticing the mistake! LOVE hearing this Nere!!!! Thank you so much for your comment!! Made this today, on my day off. I knew it would be good, husband requested spaghetti & meatballs. My house smelled wonderful, not to mention the neighborhood! According to the hubby, “the meatballs were tasty”, the sauce was good!” Translation: he loved it! My job was done…lol. Thank you!! SO glad you love it!!!! Thanks so much Jen! Hope you come by again! loved them and so did I. Thanks this will be a keeper for us !!! Awesome!! Love to hear this Betty!!!! So glad you and your family enjoyed it as much as we do! You could definitely cook the meatballs in the crockpot, but I wouldn’t recommend skipping the browning process. Just brown the meatballs, add the onions and peppers, red wine, tomato paste, water and then transfer to the crockpot. I made this recipe last night, overall it was good. I don’t know if it’s the best ever, but it does have a good savory flavor (probably thanks to the red wine). The sauce came out a rich darker brown color rather than bright red, which my mother complimented as being the correct color for a well simmered sauce. The meatballs were very easy to make (was my first time) and browning them was also easy. I’m not a huge meatball lover to begin with but my boyfriend said they were wonderful. I thought they tasted a little bready, maybe next time I’d add less saltine crumbs or more seasoning. I added sauteed mushrooms and black olives and fresh basil leaves and some red chili pepper flakes for a bit of spice to the sauce. My boyfriend took one bite and his eyes got wide and he raved about it. Mission accomplished! I don’t usually take the time to post things, but these were TRULY fabulous and I just couldn’t keep quiet about it. My favorite part was the sauce — red wine and tomato paste ARE the secret ingredients. So simple, yet divine! I absolutely LOVE the hear this! So glad you loved them as much as I do! Thanks Stephanie! I am going to try this. It sounds so good. I was wondering how it would turn out with ground turkey? 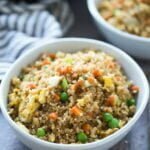 Just made your recipe and it was fantastic! 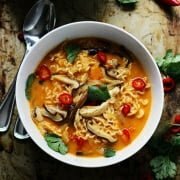 I’ve already shared it directly with some fellow foodies! So far I’ve tried 4 recipes and all well fantastic. I had a problem frying the meatballs; when I tried turning them, they fell apart (I ended up smashing all the meatballs and the sauce became more of a bolognese (still delicious). But for the future, should I put 2 eggs to help them bind? I deliberately kept the meatballs large, and I didn’t press down on them to make them tight, do you think that would help? 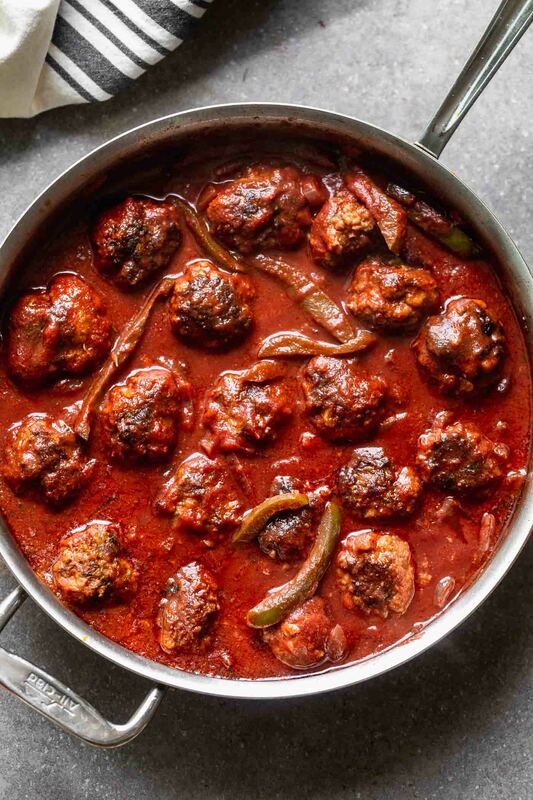 Yes, while looking around for some new variations on my trusted meatball and sauce recepe, I was surprised how many “best recipe” excluded so many key ingredients like the wine, peppers, and the method. I was going to post my recipe, then I found this one. This recipe is as close too, for every ingredient and method, as my own, I don’t measure either. I use about a cup and a half sauteed mushrooms and two stalks chopped celery in the sauce, after that the two recepes are identical. Using wine brings out the low earthy tones and top acidic pitch to a red sauce. I’m not sure if I have ever made a sauce or gravy that didn’t include a reduced red or white wine. I guess that I’ll just stick to this recipe,, well done!! I’ve made this 15+ times and every time I do I get raving compliments. 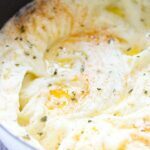 These really are the best and this recipe has become a staple in our home. So glad you love this! We loved this! It immediately found a place in my rotation. The meatballs are tender and moist, and the sauce is simple and delicious. Thank you so much! Will Red plum wine be ok to use? 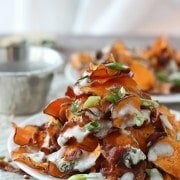 I’d love to try this recipe it looks really good!!! I’m not sure what Red plum wine is, so I can’t say. If it’s similar to a pinot noir, merlot and such, then it should be fine! Red wine vinegar won’t work, sorry Gloria!